The 5 Highlighters in One is a cute, circular, and useful highlighter, which looks like a flower. It consists of 5 colorful highlighters including: pink, yellow, blue, orange, and green. These colorful highlighters look like the petals in a flower. The translucent, clear body can be imprinted with your company’s logo using standard silk screen. 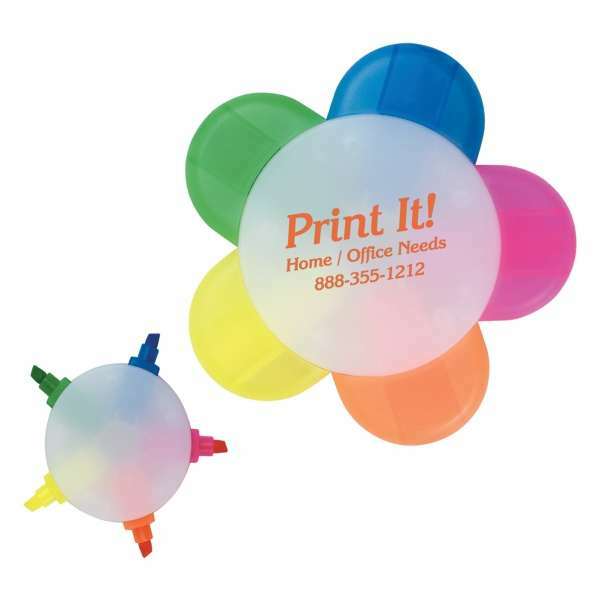 Multi-color print is available, with an additional charge. Use this highlighter as a giveaway, to promote your brand: at trade shows, seminars, workshops, school, and college events.